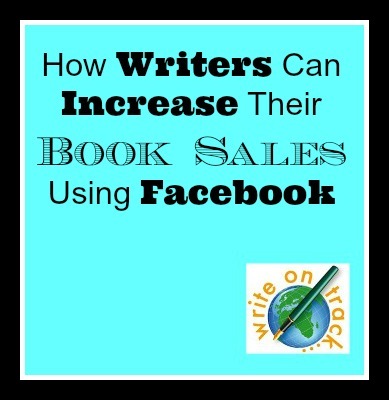 Can writers benefit by using Facebook? 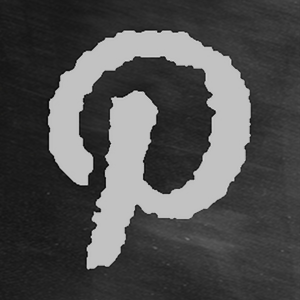 Will it help them sell more books, build a community, increase brand awareness? I’ve recently come across a number of authors who are saying that Facebook, for them, has been a waste of time, that their reach has dropped, that they are finding it hard to increase their likes, that it just isn’t resulting in click throughs to their website or to book purchases. While I agree that increasing your reach on Facebook has become more challenging, I still believe it is well worth the effort. 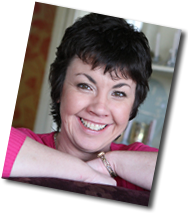 You must have a personal profile on facebook before you can create a facebook page, for example, my personal profile is under my own name Lorna Sixsmith, and it’s where I share news with many friends. It is relatively straightforward to create. Sign up at www.facebook.com by following the steps and facebook will even help you to locate some of your friends. To create a page, you need to visit this link, choose ‘brand or product’ and follow the steps to create a facebook page. Most authors name their facebook pages as their own name and add ‘books’ or ‘author’. You will need to upload two photographs. One is your avatar and will be resized to 180 x 180. Many authors use a photo of themselves, sometimes reading a book or holding their own book. The cover photo is a wide landscape photo with the dimensions of 851 by 315. 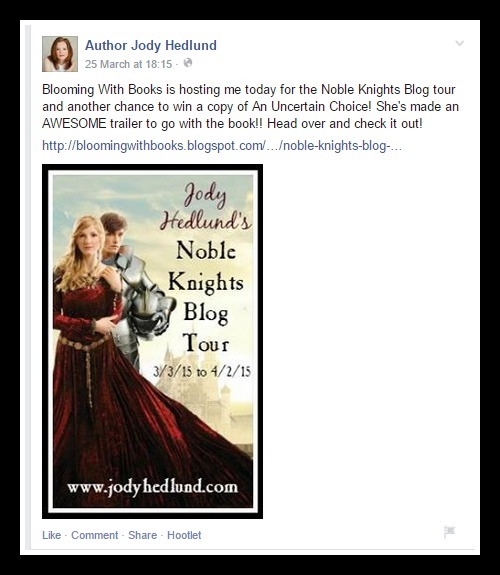 Many authors use a collage of their books or a picture from their launch for this image. You should have a number of goals for your Facebook page, I’m going to list them below and show you examples of how I (using my own author page) and other authors are doing it well. 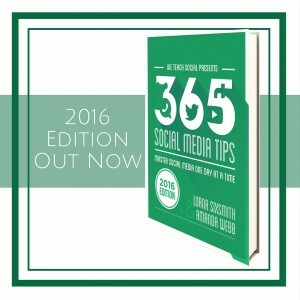 I hope it inspires you to stick with it and increase your own book sales from your use of Facebook. One reason I like having a Facebook page is because I’m interesting in the response to particular stories. If I’ve written a blog post about a subject that I might include in my next non fiction book, I’m intrigued to see if I will get much response on the blog, Facebook page and Twitter. 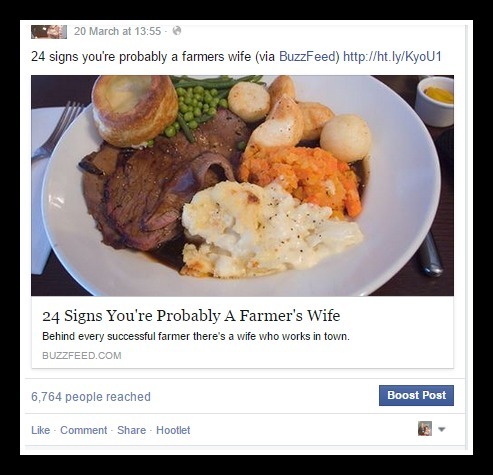 As my next book is going to be tongue-in-cheek humour, focusing on farm wives, I was delighted to see that a post focusing on a similar topic I shared from Buzzfeed reached over 6000 (my usual reach on facebook updates is 200-400 from a follower number of 850). Think of Facebook as a place not to sell, sell, sell but to communicate with your readers and one of the benefits of that is receiving feedback – both on existing books and perhaps on ideas for your next ones. All authors want to promote their books but that doesn’t mean that every update can be about book promotion. It will come across as too salesy and just won’t interest people. However, there’s a number of ways you can promote your upcoming or new books, pique people’s interest and gain sales – all without seeming a hard sales. If you are genuinely excited about your new book and share those emotions with sneak peeks of illustrations, the front cover or even very short extracts, they will all serve to whet the appetite of your potential readers. 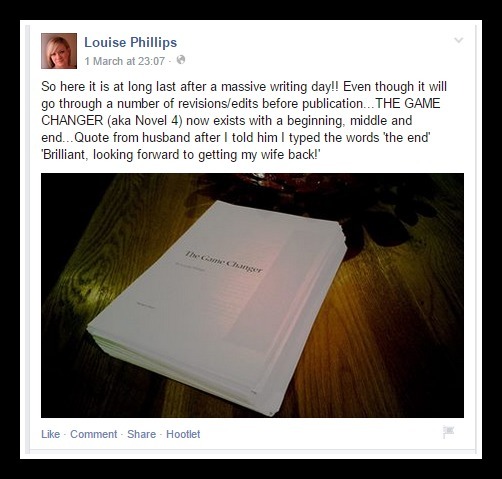 Louise Phillips shares a photograph of her finished first draft – as one of her avid fans, I’m already looking forward to reading it. Most authors display their books on the cover image or avatar. Adding a testimonial by a well known author or critic will really give it kudos and sparkle! Hazel Gaynor won an RNA award recently and it’s displayed quite subtlely (yet is noticeable) on her avatar. Both avatar and cover image look very effective in promoting both books. Many of your followers will become your community, your brand ambassadors and yes, your friends. I now feel that I know some of my followers so well (because they comment regularly) that I’m almost surprised I haven’t met them in person yet, I actually feel like I have. 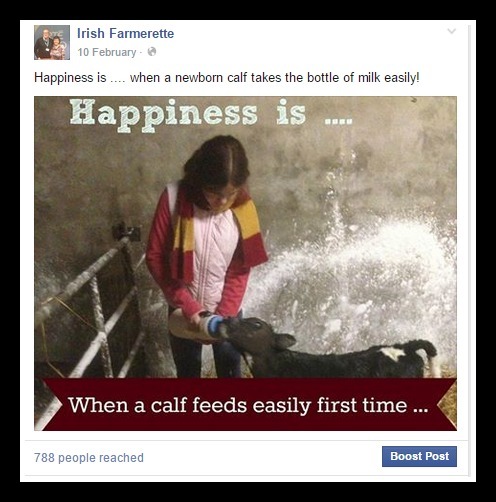 Be chatty and friendly on your Facebook page, acknowledge any comments with by clicking the ‘like’ button or replying individually to them. Have you ever thought of having a Facebook book launch for those who can’t make it to your launch in a physical venue. You could run it for an entire day, uploading a new update every hour on the hour. Content could include quizzes, sneak peeks, competitions for a free copy, sharing some new information about the inspiration for your book, making your secret ‘inspiration’ boards on Pinterest public and share them to your Facebook page, include a video, share photographs from where you are spending the launch day – anything people will be interested in but ensure they come back again and again by promising competitions and they will come back to see who won too. If others are enjoying your books, you will feel that you want to shout it from the rooftops and compel others to go out and buy it.Don’t make every update a bragging one but when you achieve something, be it getting into charts or being featured in a magazine, do share the good news. Sharing occasional reviews is a nice way to do it too – just mix these with entertaining or informational content too. 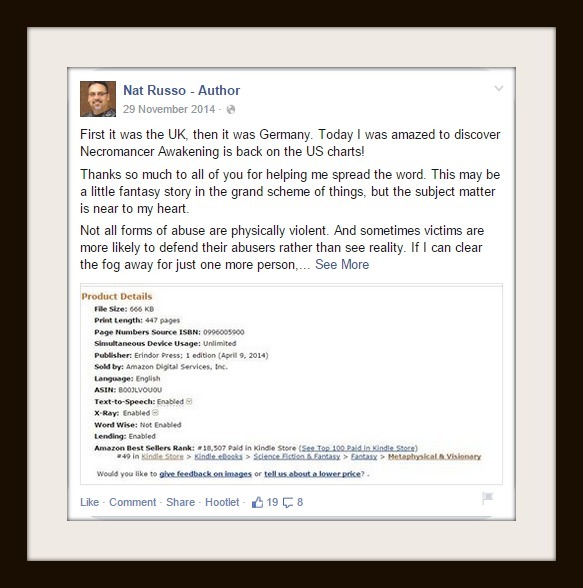 Here, Nat Russo shares his good news about getting back in the US charts. Remember that images are good so taking a screenshot or photograph works well to emphasise your progress. I find that, in particular, those who supported you in your early days will really go out of their way to congratulate you as they feel part of the journey. They are your ambassadors so always thank them for their comments or shares. How do you increase your fans and grow your readers? You can, of course, pay for Facebook Ads and / or boost posts but if you want to do it for free, here’s a few tips. 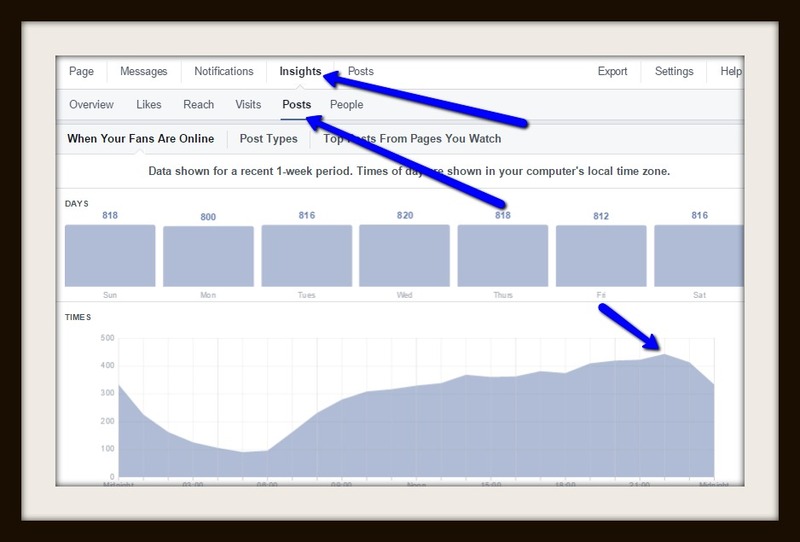 Check your insights (Facebook analytics) and check the time of day when the majority of your fans are using Facebook. As you’ll see from this screenshot of my account, posting updates in the evenings will help me reach many more people than posting in the early mornings. While I do vary content throughout the day, I do tend to post most material about my own book (links to blog posts especially) in the evenings. Schedule three of the next five Facebook updates to go out at those times and see if that increases your reach. It should do. Measure the effectiveness over the next month and then evaluate. Don’t saturate your account with content – I would recommend posting once a day, twice occasionally but don’t go mad and post three or four times. Create good content and spread it out. You need to work out why people are following you – are they just interested in you, your book or are they looking for content that’s related to the genre of your book. If you write crime fiction, your audience are bound to be interested in hearing about true unsolved crimes as well as tips on how crimes are solved, stories about detection dogs and your opinion of other novels. . If your style of writing is comedic, then provide some content designed to make them laugh. If you are writing cookery books, share links and pictures of recipes you would recommend and yes, a few of your own too. Those who follow my author page do so because they are interested in farming but they’re also looking for some humour – preferably to do with farming. Anyone who has ever bottle fed lambs, calves or any other young animals will know the relief when they feed easily as a couple of slow feeders can wear you out when you’re already tired from lack of sleep. Adding some text to this photo of my daughter bottle feeding a calf achieved good reach because of the humour. Without the text, I doubt it would have worked as well. When using images, remember that portrait images will be displayed with white space at the side so when uploading an image, it is better to use square or landscape images for more impact. It’s very easy to share a photo from your smart phone but remember, taking a few minutes to edit it in terms of size or adding text could make all the difference in terms of increasing the engagement and reach. 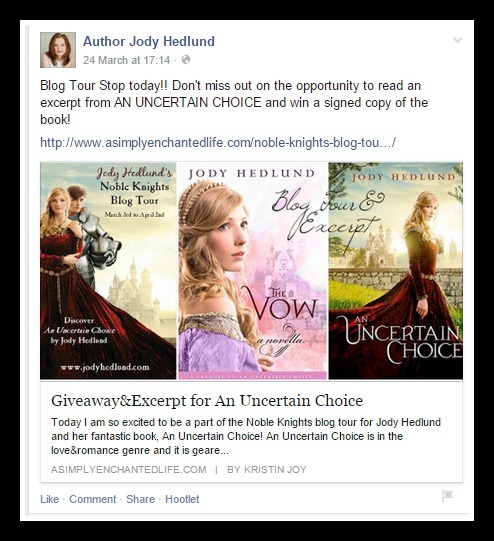 Author Jody Hedlund has a very active Facebook page and rewards her followers by telling them about various giveaways so they have a chance of winning copies of her book. This photograph of her latest book is an excellent image but you can see the white space beside it lessens its impact. Whereas, this landscape photo within the blog link fills the space and the collage of the three books should certainly capture attention in the newsfeeds. 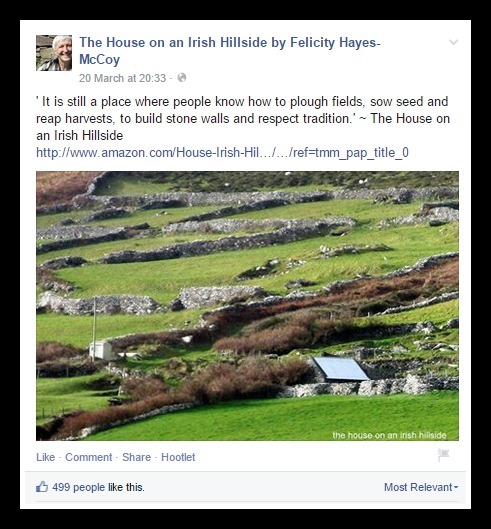 Another way to grow your readers is to whet their appetite and Felicity Hayes McCoy always does this very well by incorporating a quote from her book with a beautiful photograph from where her book House on an Irish Hillside is set in beautiful Co. Kerry. Videos are getting increased reach on Facebook now. The videos don’t have to be elaborately edited pieces although more authors are creating trailer videos now to promote their books. Vine videos are easy to make and as they can be watched in six seconds, they will get high numbers of views in people’s newsfeeds. 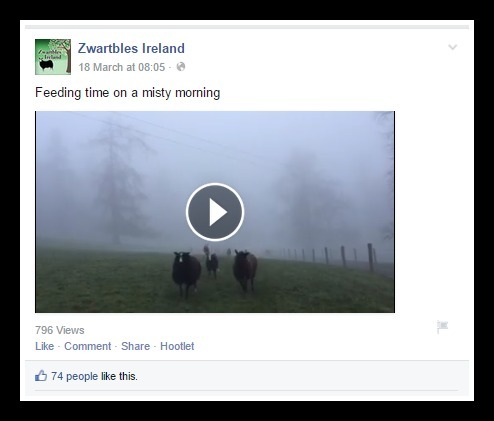 Suzanna of Zwarbles Ireland isn’t an author as yet but just watch this space I think. She’s recently started making Vine videos of her beautiful sheep and has received millions of views to date. Sharing them to Facebook increases the charm of both her page and the number of views. If you’re an author and you’ve found that something else works well to engage your followers and generate sales, do share it with us. Remember if you are hoping to get a traditional publishing deal, most publishers will be looking for evidence of your following across various social media platforms so having an engaged following on Facebook will help your cause. Having a Facebook page isn’t all about selling but by creating good content, interacting with your followers and growing your community, the sales will follow. Lorna, this is another really useful post. As I’m about to say on ALLi in case people didn’t scroll down and see your link. Does the Ministry of Agriculture reward you for your stimuli with a dinner annually? Sounds as if they should! Ha re the Dept of Agric – although I did meet someone from Bord Bia recently and she knew all about my books which was nice to hear. Bidzina Savanelli, 2016, Creative Transformation of Synergy and Homeostasis of the Nature in the Peaceful Development of Humankind. Category: Physics, Human, Society, pages 343, in English, Rome, Italy.